I'm working and starting off June with a bowl of D&R VIP in a 2004 smooth long shank Canadian Trever Talbot Ligne Bretagne Faite en Bretagne 4/3 with a black vulcanite stem. Listening to the Braves-Angels game. 2012 Anniversary Kake in a smooth medium bend 1979 Chippendale (Charatan second) Rhodesian 49 with a black vulcanite stem. Marlin Flake in my Pete Grafton 999. Dunhill Dark Flake in a Regina Scarlatta Pencil Shank Billiard. A tall bowl of Tilbury in the bamboo shanked Il Duca freehand. Starting off my smoking day with the last of this pouch of MacBaren Virginia Blend in a 2002 black sandblast full bend D.R. Ardor Urano Fatta A Mano with a slightly tapered far side of the bowl and a black acrylic stem. A bottle of Cheerwine is my drink. Watch City Old Dominion in a smooth straight early ‘60s Lane era “William Conrad” Charatan Executive Extra Large stretch apple with diagonal channel cuts on the lower right and left of the bowl along with a black vulcanite double comfort stem. Just finished smoking Jim's Va/Bur in a 2015 Basil Meadows Bing Crosby Merchant Service replica with a smooth straight thin shank, aluminum band and black ebonite stem. Ice tea and bergs is my drink. 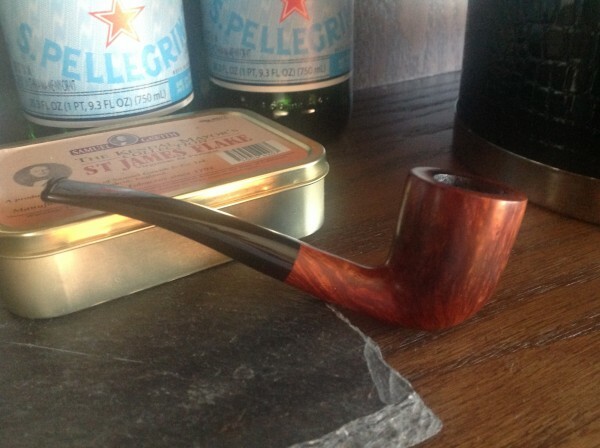 Edward G. Robinson's Pipe Blend in a 2014 Basil Meadows smooth slight bend squashed tomato with an aluminum band and a black pearl acrylic stem. Part way through this bowl of Solani 633 in a smooth straight late 1970s Charatan 4148DC Reg. No. 203573 pot with a black double comfort vulcanite stem. Country Squire Pirate Alley, in Basil Meadows Tavern Cutty. I think I smoked so much Royal Yacht back in February that I time warped to June. 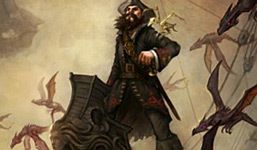 Benningtons pirates gold in a Ropp cutty. A perfect match. A couple minutes away from smoking MacBaren Navy Flake in a 1981 Ascorti Black Billiard Business with a military bit and pearl gray acrylic stem. Ice water and bergs is my evening drink. Cope’s Escudo in a very early Ascorti straight New Dear KS billiard with a smooth shank and black acrylic stem. First I guess an introduction, Hello! Nice to meet you! Just started an "after dinner" bowl of Full Virginia Flake in a Peterson Aran (80s)..
Salty Dogs plug in a Ferndown bulldog. McClelland Christmas Cheer 1999 in a 1980 Stanwell 668 medium bend with a multi-colored ferrule, half black sandblasted, half brown smooth, rough top with a black vulcanite stem. McClelland's Yenidje Supreme in a Stanwell Sixten Ivarsson billard. Family, small sporty cars, food and drink (Including tobacco) and a nice book! Carter Hall in my Cobbit Shire. That pesky Frog Morton Cellar flavour is finally gone. A few minutes away from smoking MacBaren Burley London Blend in a 2001 black sandblasted three quarter bend Rinaldo Lithos YY bulldog with a tortoise shell acrylic stem. 2012 Louisiana Red in a 1984 three quarter bend medium brown Ascorti KS Business Dublin with a black acrylic stem. A few minutes away from smoking Edgeworth Ready Rubbed Match in a very much appreciated 1979 brown, slight bend grain etched flat front Stanwell Rego 969-48 (09) with a black vulcanite stem. Old Colonial in a medium bend beater 1979 Aalborg natural freehand made by Nording with a black vulcanite stem. Marlin Flake in a Fe.Ro straight grain bent Dublin. Last night: new flava o' the month, blender's gold burley and black topped off with the last of the golden burley. 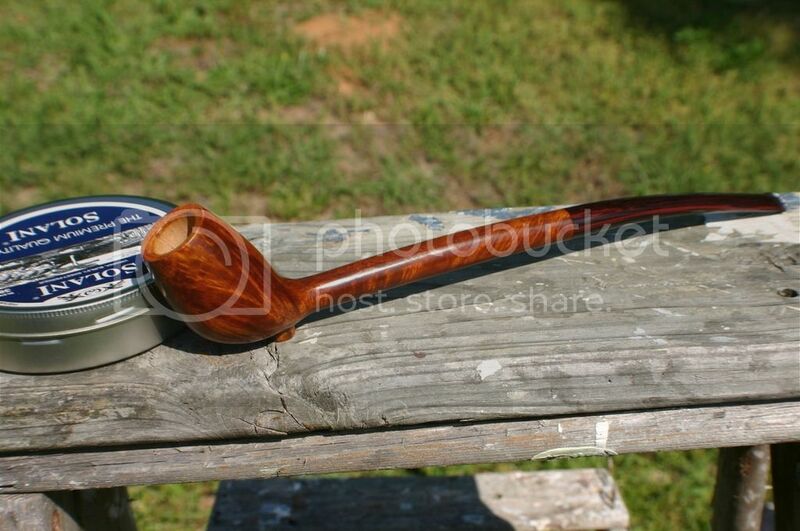 Half way through this bowl of Granger in the third pipe I ever bought ($1.95), a 1974 smooth straight French briar Hadley Apple with a black vulcanite stem. A bottle of 7-Up is my drink. Looking forward to seeing an old friend of mine this afternoon. Haven't seen him in twenty-five years. It'll be a good reunion. Enjoyed the reunion with my old friend, autographed some books I wrote and some I drew, and as he liked the smell of Edward G. Robinson's Pipe Blend, I smoked a couple bowls to keep him happy. I was happy, too! Watch City Flake #558 in a smooth straight pre-transition Barling 313 T.V.F. EXEXEL pot with a black ebonite stem. MacBaren Virginia Flake in a late '90s half smooth/half etched freehand sitter, medium bend Nielsen Viggo with a pearl brown acrylic stem. Ice water and bergs is my drink. 9 year old Smoker's Haven Best Blend in Vacher sandblasted billiard. Just finished smoking Old Dark Fired in a smooth briar calabash shape 1984 Fero Danese made in Italy with a black vulcanite stem. A tasty day. I bought some cherry blends to shut the women at camp up. haha Something called Black Cherry, another called New Cherry and Gawith, Hoggarth & Co. - Top Black Cherry which was my favourite- If I had to pick one. Honestly, I am not huge on strong aromatics, but I think a pipe or two a week of this stuff could be a nice change. All smoked through my MM cobs. Orlik Dark Strong Kentucky; Just opened the tin today. I fully rubbed the flakes out on my first bowl- gonna fold and stuff this time. Smoking it in one of my green Dr Grabow color dukes and washing it down with an ice cold diet Dr Pepper. Just finished smoking 2012 Louisiana Red in an unbranded '70s Charatan smooth straight Billiard with a black vulcanite stem. Solani 633 in a smooth straight late 1970s Charatan 4148DC Reg. No. 203573 pot with a black double comfort vulcanite stem. Just finished smoking Sir Walter Raleigh in a black 1997 Brebbia Jubilee 925 silver banded grain sandblast briar calabash with a black acrylic stem. D&R Windsail in an Italian smooth billiard no name, group 5, vulcanite tapered stem. Sutliff Ready Rubbed in a blasted Savinelli De Luxe Milano 904. Royal Yachy, in the Basil Meadows Tavern Cutty. 08 McCranies Red flake tinned in 2012. In a BST Cutty. On my balcony, in the sunshine. Key Largo in a GBD Militaire bulldog. Just finished smoking Edward G. Robinson's Pipe Blend in a 2014 Basil Meadows smooth slight bend squashed tomato with an aluminum band and a black pearl acrylic stem. A bottle of Cheerwine is my drink. A quarter of the way through this bowl of McCranie’s Red Ribbon, vintage 1996 in a smooth straight WW2 Pre-Republic Peterson Sterling Canadian with a sterling silver band and a black vulcanite p-lip stem.